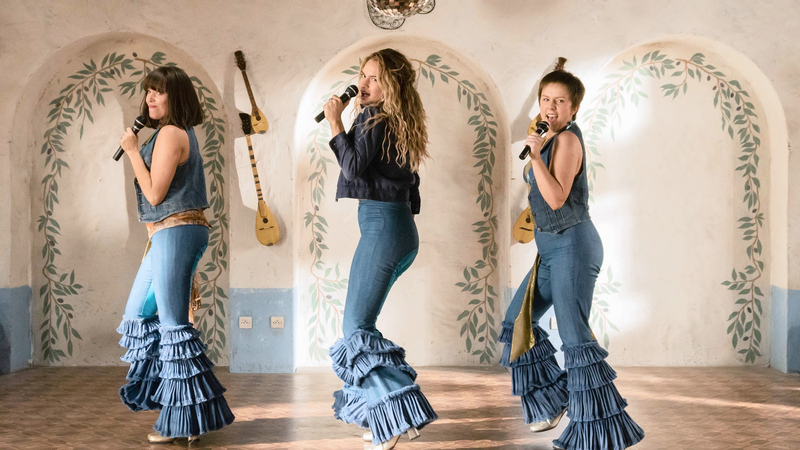 Waiting more than a decade to release a sequel, the candy-coloured world of Mamma Mia! returns to cinemas this summer in the form of Mamma Mia! Here We Go Again. Akin to a multi-layered moussaka best served with numerous guests around a gigantic table, Here We Go Again is decadent in its production design, cinematography and sheer outrageous set pieces with its all-star cast. Corroborating with the ten-year gap between the two films, Here We Go Again finds the original cast grieving the death of Donna (Meryl Streep). To remember her name and legacy, Sophie (Amanda Seyfried) has invested in giving Hotel Villa Donna a much-needed makeover to attract tourists to the Greek island. Inviting her fathers, mother’s friends and her grandmother, her plans are cut short after a storm hits the island and forces all the returning cast to band together to make the hotel’s opening night party a success. Interweaving the trials and tribulations of Sophie with that of her mother in 1979, portrayed gloriously by Lily James, their stories come to mirror one another in a certain regard. Slicing up the narrative into flashbacks, as well as the ongoing action on the island, the film’s opening number of When I Kissed The Teacher is evidently not as grandiose as opening on the titular song, or any other better-known ABBA song. Still, what this serves to underline is the lengths to which director Ol Parker, writer of The Best Exotic Marigold Hotel series, holds back the big numbers for future scenes. Nonetheless, this is not to say the opening song and dance lacks any glitz or glamour. By selecting this song to fit in with Donna’s graduation at Oxford, the action places down a marker for proceeding to greater lengths with its sheer number of extras, costume design and choreograph. Upon exiting the graduation hall, a mass of extras, led by James, a younger Tanya (Jessica Keenan Wynn) and a younger Rosie (Alexa Davis), proceed through Oxford on bikes. Captured in a clean dolly shot that would make any serious cinephiles titillated with cinematic splendour, Parker and DOP Robert D. Yeoman waste little time in imbuing audiences with style in front and behind the camera. Deploying the first famous number of the film in Waterloo, the journey to this song leads Donna to encounter a young Harry (Hugh Skinner) in Paris after she decides to travel and enjoy her youth. Whilst impersonating Colin Firth to an uncanny level, Skinner’s shy British school boy approach flourishes in the extravagant performance of Waterloo, accompanied by obligatory patriotic references to Napoleon from the French waiters in the restaurants where the scene unfolds. Though the lyrics and compositions of Benny Andersson and Björn Ulvaeus naturally take centre stage, composure Anne Dudley gives subtle renditions on the famous chords in the notes of an accordion when Donna is in the city. Tentatively setting up the other younger characters in Bill (Josh Dylan) and Sam (Jeremy Irvine) feels a comparably low point when approaching the joyous reunion of the older characters. Adorning wide shots of the sea as hordes of people run down to the bay, with numerous boats incoming, the sequence could not be grander, even if Dancing Queen the central song in this moment. Capturing the magic of the first film in all is splendid glory, the scene typifies what came to make Mamma Mia! a household staple in this country; actor and extras alike going hell for leather dancing and jiggling to the brilliance of ABBA. Unable to hold back roars of laughter during James and Dylan’s rendition of Knowing Me Knowing You, all thanks to Steve Coogan’s Alan Partridge, moments of the film do become overtly hilarious given ABBA once becoming a figure of satirical ridiculing during the 1990s. Similarly, writers Richard Curtis, Catherine Johnson and Parker do not refrain from self-referential moments between Julie Walters and Christine Baranski, surely a meta epitome of the audience. Keeping Pierce Brosnan’s solo singing to a bare minimum, one cannot but help miss that overwhelming sense of your drunk uncle singing karaoke at a family wedding here. Regardless of your cynical nature around the sequels of this magnitude, the filmmakers of Mamma Mia! Here We Go Again keep a card close to their chest for the final few scenes in unveiling Cher. Delivering clear big screen moments, of which will leave audiences itching to return and experience it all over again, you simply cannot deny that this eccentric mix of ABBA and cinema still holds magic.